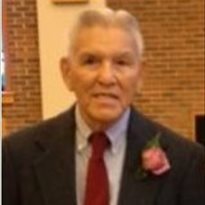 Alfonso “Ikie” Catanach passed away Sept 14th, surrounded by his family after a brief illness. One of eight children of James and Eulalia Catanach, Ikie was born on Dec. 20, 1926. He was a kind and gentle husband and father and more than anything enjoyed spending time with his loved ones and dog, Chaco. He will be remembered for his strong Catholic faith, service to his country, dedication to his family, and his love for Notre Dame, NY Yankees, and Green Bay Packers. Ikie retired after almost 30 years of working at the NM State Penitentiary. He was preceded in death by his parents; loving wife and constant partner, Stella; his siblings - Billy, Margaret, Jimmy, and Murray. He is survived by his children Patty Catanach (Lloyd), Robert Catanach (Rosie), and Priscilla Gaussoin (Roch), his six grandchildren - Nicholas Valdez (Jessica), Sarah Gaussoin (Wesley Todd), Travis Gaussoin, Dr. Therese Catanach, Maria Catanach, and Thomas Catanach, and two great-grandchildren. He is also survived by his brother Marcos (Lila), sisters-in-law Teena, Gloria, and Lou Catanach, Celine Ortega (Charlie), Violia Romero (Mariano) and a multitude of extended family and friends. The family appreciated the dedication and help his physicians and their staff provided to Ikie this last year. Appreciation and gratitude also go to Margaret Murray and Mike Lara for their love, support, and selfless attention to Ikie. A Rosary will take place Monday, Sept. 22nd at 6pm at Rosario Chapel and Mass of Christian burial will be celebrated on Tuesday, Sept 23rd at 9am at St. John the Baptist Catholic Church, Santa Fe with interment to follow at the National Cemetery. In lieu of flowers the family requests memorial contributions be made to the Carmelites, 49 Mount Carmel Road, Santa Fe, NM 87501. Honorary pullbearers will be the grandchildren.